The Maximum Operating Temperature is the maximum body temperature at which the thermistor is designed to operate for extended periods of time with acceptable stability of its electrical characteristics. Both the Maximum Operating Temperature and the Maximum Power Rating must be considered when designing a thermistor circuit. 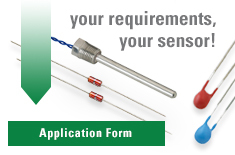 In temperature sensing applications, the current is minimized to virtually eliminate any self heating. Therefore, only the Maximum Operating Temperature needs be considered. In liquid level detection applications, it is very important to consider both the Maximum Power Rating and the Maximum Operating Temperature in both the presence and absence of the liquid. In any case, exceeding either of these specifications can affect the electrical characteristics and/or the Stability of the thermistor. The Maximum Power Rating, usually expressed at an ambient temperature of 25° C, is the maximum power that a thermistor will dissipate for an extended period of time with acceptable stability of its characteristics. The Maximum Power Rating will be derated for temperatures above 25° C to insure that the Maximum Operating Temperature is not exceeded due to “Self Heating” of the thermistor.